But as a good and loving Father would have it, and with the encouragement of my husband, I listened to the nudging within to let the dishes sit, forget about vacuuming, and not worry about the receipts that hadn't been entered. As I moved forward with the plans for rest I so needed (starting with a Starbucks date together (insert grin - isn't he sweet? )), Jesus reminded me that Sabbath is a gift for us all, regardless of what we have accomplished in the time leading up to it, what happens in our schedule, or who enters into our day unexpectedly. Peace comes from connecting with God and allowing our souls to breathe, not by perfectly aligning our schedules and circumstances, or completing to-do lists. I'm letting go of the idea that I have to perform well in order to 'earn' a day of rest. Perhaps you need to hear that too, and live in that freedom? Taking a day, or even a few hours of rest, is a gift from our Father - will you accept it this weekend? Let's let go of the expectations we have for ourselves and for others. 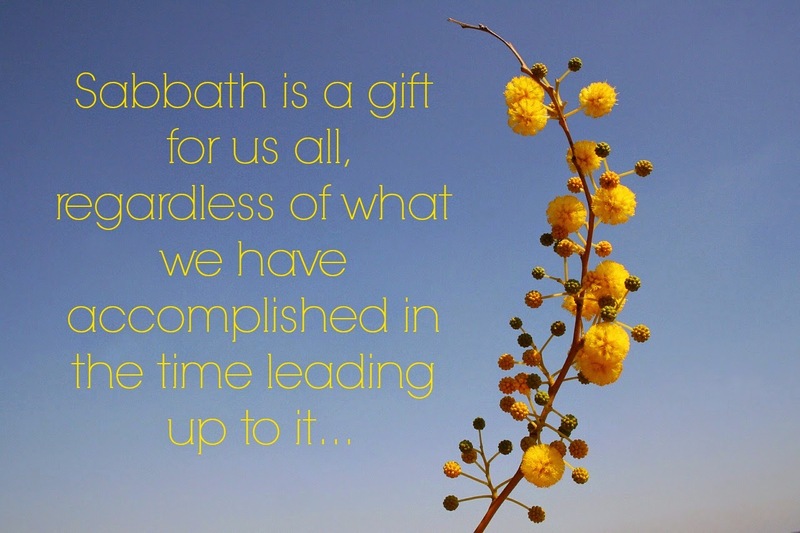 Sabbath is a 'hard stop' to everything that tugs at us, everything that competes for our peace and joy. Sabbath is a time to do things that refresh us, whether that be creative, relational, entertaining, or simply quieting our minds and social connections online to make space for God. There's no formula! I have learned that it is okay, yes important to set aside time once a week (at least) to do something I enjoy and look forward to, even if it feels like a 'waste' of time. The love and grace of God, when understood and fully embraced, will always look and feel incredibly lavish and wasteful, in a sense. We will never deserve the gifts of God, so let's all commit together to receive from the Lord for a few moments today, a few hours this weekend, or even extended time away with those we love - without feeling guilty! As it turns out, not only did our tires need rotation and general maintenance, but there was a nail in one tire! Letting go of my plans saved me from getting stuck on the side of the road, and that surely would have been a stressful Monday!! In just the same way, when we let go of our plans, and embrace the 'regular maintenance' and refreshment of a weekly Sabbath, we are able to quiet our hearts and see the deeper issues in our hearts, health, and relationships. Wouldn't you prefer to avoid a bigger issue that could have been helped with a little preventative care? Rest is what prepares and fuels us for a new week, not being productive. Sabbath is for you too, friend. It's for me, it's for all of us, regardless of whether we think we deserve it or not. Blogger Lisa-Jo Baker & husband Peter bought their first home - at 40 - and what she learned as she waited - we are ALL waiting on something; this might be the word you need to hear. I know I did! Living Well Spending Less - I've been waiting for this book to go on sale and it did this week, yay!! (sorry if you missed it, but go buy it anyway!) You won't be disappointed.